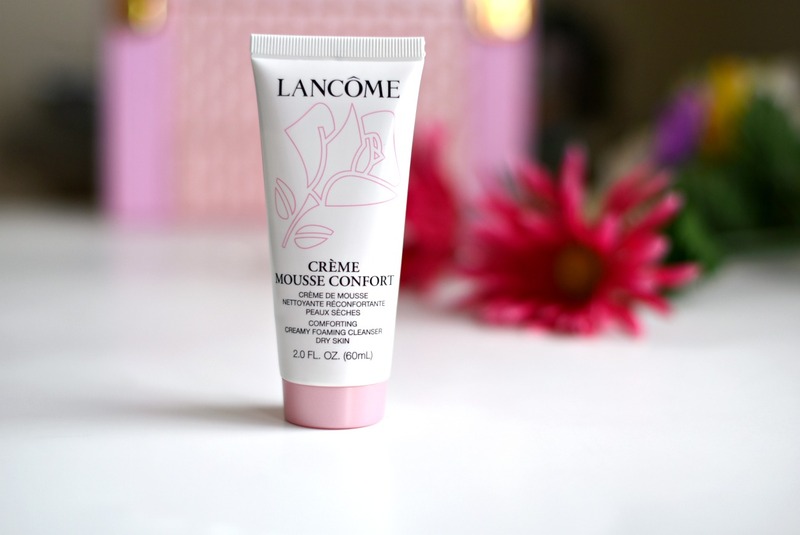 Is it worth to buy Lancome 'Creme Mousse Confort' Creamy Foaming Cleanser? Happy Thursday beauties, hope you are having great week so far. I know I talk too much about Lancome but I really like most of their beauty products and today let me show you this Lancome 'Creme Mousse Confort' creamy foaming cleanser that I've been using for several weeks. According to the label: "This rich and creamy cleanser with nourishing rosehip oil and soothing Rose de France delivers a voluminous foam to gently remove makeup (even waterproof), dissolve impurities and leave the skin soft and supple." This Lancome 'Creme Mousse Confort' Creamy Foaming cleanser is a lightweight cream cleanser with rose scent, it's not unpleasant but I feel like the scent is becoming stronger after using it for weeks. I apply it every evening to take off my makeup and it really does a great job __ takes of the makeup without leaving my skin feel tight. It doesn't produce too much foam, (at least, on my dry skin, ) which is OK for me. I don't use it to remove my eye makeup, because I prefer cleansers that are specifically formulated for removng eye makeup , so there is no necessity to use a regular makeup remover for my eye area. It takes off my makeup nicely, without leaving any residue. The scent. Even though I love rose scent, when it comes to skin care products I don't need any scent in them. And the main question: is it worth to buy Lancome 'Creme Mousse Confort' Creamy Foaming cleanser? __ well, if you already have your favorite cleanser that does everything that you expect from a good makeup remover, stay with it. If you have sensitive skin and looking for the cleanser that will not irritate your skin while take off your makeup, then you should give this cleanser a try. It's not cheap but it lasts quite long so it's worth it. Thanks for reading beauties, wish you all a wonderful day. I know, the scent can be really ennoying. The scent is one of the biggest reasons why I use certain things, it really throws it off when you don't like the smell! I never ever splurge on cleanser. My skin is pretty good and thankfully not sensitive so I get away with lots of cheaper products. LOL! I love honest reviews like this! I have pretty sensitive skin so I try to stick with organic face washes and scrubs! I agree with you about the scent! All my skincare products have to be fragrance free or have a really slight scent!Lovely post! Oooh, looks so lovely! I know some peeps don't like scents in their skincare...though I'm the opposite sometimes. I love anything rose scented too. Thanks for stopping by my blog and leaving your comment. :) Want to follow each other? I'm following along on Bloglovin, Instagram, and facebook. I haven't tried many Lancome skincare products before. This one sounds nice! Thanks for sharing your review. Thanks for sharing this! And about a scent - I agree with you, the smell could be very annoying sometimes. I don't like scents in my cleansers either, but it sounds good for the most part, thanks for sharing. I love cleansers, so why not giving a try to this Lancome one, although the rose scent is strong... I have sensitive skin, if not ultra sensitive, and knowing products that dont't irritate my skin is always good! This looks so awesome! Thanks for sharing! I'm not a fan of skincare products that have a scent either, great review! I love floral scents too..I might try this out in the counter next time..
As soon as I read the scent was rose and that you felt it grew stronger with use I knew that wasn't for me sadly. I despise that artificial scent of roses! Lancome's products are very good ones and the mousse consistency is definitely one of my favourite. Great review. It sounds nice but the smell would put me off as well! I can't stand strong strong things on my face! Thank you for review! I totally agree with you about the scent in skin care product. I don't wanna smell like a candy!